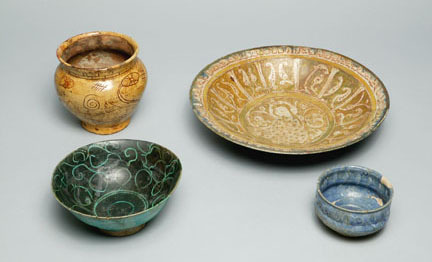 Clay and ceramic materials from Persia (modern Iran) comprise one of the largest groups of objects collected by Rietz. Numbering over one hundred objects, the rich tradition of Persian pottery is demonstrated in this collection, with examples dating from the first century BCE to the late 19th century CE. The bulk of the collection dates from the Medieval Islamic period of the 11th -14th centuries CE. Objects from the major ceramic producing areas of Persia during this period, Kashan, Nihavand, Zenjan, and Rayy, are represented. Most of the objects are serving pieces with beautifully multi-hued decorative glazes and designs. Used by the nobility and merchant classes, the size and shape of the platters, dishes, and bowls suggest communal sharing of food and drink, and attention focused on matters of the table and eating.